David Ortiz of the Red Sox getting a hit in front of Yankees catcher Jorge Posada. The 2004 American League Championship Series is remembered for the Red Sox's historic comeback from a 3-0 deficit to stun the Yankees. 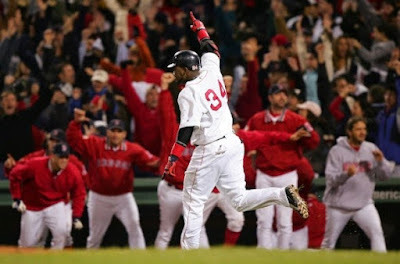 The most memorable moments were the Red Sox coming back against Mariano Rivers in Game 4, including Dave Roberts' stolen base, followed by Bill Mueller's liner back up the middle to score him with the tying run in the eighth inning; Ortiz's walk-off homer that night; Curt Schilling's heroic effort and his bloody sock in Game 6, and the Red Sox blowing out the Yankees 10-3 in Game 7. The one game of the four Red Sox victories that gets lost in the shuffle was Game 5, the last time the Yankees and Red Sox squared off at Fenway Park in the playoffs until this year's Division Series. Game 5 was on Monday, October 18, 2004, a 5 p.m. start, as it was basically a make-up game from a rain out the prior Friday. The game started roughly 15 hours after Game 4 ended in the wee hours of the morning. Mike Mussina got the start for the Yankees, and Pedro Martinez was on the hill for the Red Sox. 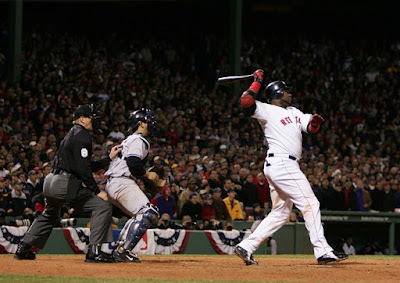 Boston picked up right where they left off from the night before, as they got two in the bottom of the first, on an RBI single from David Ortiz and Jason Varitek drew a bases-loaded walk. Bernie Williams got one of those runs back when he led off the top of the second with a solo home run. It stayed that way until the sixth when Derek Jeter hit a three-run double to left to make it 4-2 Yankees. That was it for Martinez, who had one of his typical outings against the Yankees that season: 6 innings, 4 runs (all earned), 7 hits, 5 walks, 6 strikeouts. Mussina retired the Sox in order in the bottom of the sixth, but was lifted in the seventh after Mark Bellhorn led off the frame with a double. Mussina went 6 innings, allowing 2 runs (both earned) on 6 hits, 2 walks, and 7 strikeouts. Tanyon Sturtze relieved Mussina, and he got Johnny Damon to hit a pop-out to short stop, then walked Orlando Cabrera, and got Manny Ramirez to hit into a double play to end the frame. In the eighth, Tom Gordon came on for the Yankees, and Ortiz launched a home run over the monster to make it 4-3. Kevin Millar walked, and Dave Roberts went in to run for him (just as he did the night before). Trot Nixon followed with a single to make it first and third for Boston with nobody out, and that was it for Gordon. Mariano Rivera came in, and he got Varitek to hit a sacrifice fly to center to score Roberts and tie the game at 4. Rivera then struck out Bill Mueller and got Bellhorn to strike out swinging to keep it tied heading to the ninth. Keith Foulke, the Boston closer who got the final out of the eighth, stayed on for the ninth inning. Williams and Jorge Posada each hit pop-ups for the first two outs, and then Ruben Sierra earned a walk. Tony Clark was up, and he hit one into the right-field corner and it hit the top of the short fence and bounced into the stands for a ground-rule double, holding Sierra at third base, preventing him from scoring. If the ball went back into play, Sierra most certainly would have scored to give the Yankees the lead. Miguel Cairo, who was in the lineup because of his success against Martinez, popped out to first base to end the top of the ninth. In the bottom of the ninth, Rivera stayed on for the Yankees, and Damon led off with a single, but was caught stealing for the first out. Cabrera grounded out and Ramirez flew out to end the inning, and send this one into extras. Bronson Arroyo pitched a scoreless tenth for Boston, as he retired Jeter (pop-up), Alex Rodriguez (strikeout swinging), and Gary Sheffield (strikeout swinging) in order. Arroyo was the center of attention that season, as he drilled A-Rod in a game in July that started a brawl epitomized by Varitek punching Rodriguez in the face; and then in Game 6, when A-Rod swatted the ball out of his hand going down the first-base line, and was ruled out for interference. For the Yankees, Felix Heredia and Paul Quantrill got through the tenth inning, and Quantrill stayed on for the 11th, and was relieved with two on and one out by Esteban Loaiza. Loaiza got Cabrera to hit into a double play to end the 11th, and the starter working out of the bullpen stayed on and pitched a scoreless 12th and 13th. In the 14th, Loaiza struck out Bellhorn, walked Damon, struck out Cabrera, and walked Ramirez. That brought Ortiz to the plate with two on and two out, looking to be the hero for the second straight night. It turned into an epic at-bat, and on the 10th pitch, Loaiza tried to go up and in on Ortiz, and he fought it off, hitting it into center field. Damon raced around third base to score the winning run, and as Joe Buck said on Fox, "he can keep on running to New York!" David Ortiz and the Red Sox celebrate. The Red Sox earned a 5-4 win in 14 innings to send the series back to Yankee Stadium , where they won Games 6 and 7 to clinch the American League Pennant. In the World Series, they swept the St. Louis Cardinals to break the Curse of the Bambino and win their first championship since 1918. They have won two titles since then, in 2007 and 2013. As for Loaiza, whom the Yankees acquired at in July 2004, he then went to the Washington Nationals (2005), before stints with the Oakland A's (2006-07), the Los Angeles Dodgers (2007-08), and a return to the White Sox in 2008 before retiring. In 2010, Loaiza married Mexican-American singer Jenni Rivera and made several appearances on her family show "I Love Jenni." Divorce papers were filed in October 2012, and she died in a plane crash shortly after, on December 9, 2012, before their divorce was finalized. Earlier this year, on February 9, 2018, Loaiza was arrested in San Diego, with over 20 kilograms of cocaine and was charged with felony counts of possession or purchase of narcotics and transportation or sale of narcotics. In August, Loaiza pleaded guilty to federal drug charges in California, and he faces a 10 years to life prison term when he is sentenced in November.